Large data capacity - stores over 256,000 data records: AGL3080 Photo Tracker is a GPS-based data logger designed to provide location information for digital photos. Unlike other similar products, AGL3080 does not need driver to operate. When you plug AGL3080 into a computer via USB port, it will simply appears as an external drive. The recorded log is standard NMEA format which is compatible with many online tools such as JetPhoto, GPSVisualizer, etc. I bought an AGL3080, but returned it immediately because the accuracy was terrible. The tracks drifted all over the place, in some case by more than 100 metres from my actual route, even in wide open areas with a clear view of the sky. In addition, I was not able to get the waypoint marking function to work, despite my best efforts. I own a Wintec WBT-201 data logger, which works quite well in open areas but has difficulty in urban areas with tall buildings (which is a failing of all GPS units). I read that the SirfStarIII chip in the AMOD unit is supposedly better in urban areas, so I bought the AMOD unit in hopes that it would perform better than the Wintec. Instead, it performed much worse. In open areas and forest areas, the Wintec tracks quite accurately, straying from my actual path by only a few metres. OTOH, the AMOD was all over the place. In some cases it was so bad that it would be impossible for anyone to determine what trail I followed or which street I walked along. Nice with a Mac! Review the device, not the software bundled. To help people struggling with the whole Mac compatibility reviews and of the bundled software that I too tried to figure out when looking, let me boil it down for you. A GPS data logger does one thing. It records a file of your location at some set interval (often 1 second). That is it (although some will include more or less data on your location that others such as altitude, current speed, etc.). The next two questions you should then ask yourself about any data logger to be used with any computer system are A) In which file format is the log recorded? and B) Can I get the log from the device onto my computer. For A) some loggers log in one of the industry standard formats while others use their own proprietary format. Regardless of what format it logs, is it one that you can easily convert to other formats. GPS Babel is probably the most popular log file converter, runs on both Windows and Macs (as well as other systems), can convert between a ton of different formats, and is free. So as long as the logger you are looking at uses a format you can convert from, you are all set there. This logger, the AGL3080, uses standard NMEA format written to plain text files. For B) you want to know is the data stored in a way your computer can get to it. Some have to be "talked" to and then the data "downloaded" out of the device. Others show up as a mass storage device where you can just grab the file. For a Mac, all you want to know if when I plug the device into my Mac, what do I need to do to get to the log files. This logger, the AGL 3080, simply appears on your desktop like a USB thumb drive and all the log files are there as plain old text files (with an extension of .log on them). Select them and drag them to your desktop. Done. No software to install, no communication protocols, or any of that stuff. At this point you have your data. Any talk about bundled software ignore. You can use any number of GPS tools out there, free, shareware, commercial, etc. To review the logger based on the software it comes with is stupid. This would be like reviewing a new digital camera and giving it a bad review because the photo editing software bundled with it stinks or is windows only, etc. You have the data, you have a way to convert the data to other formats, not search for a Geocoding application that suits your tastes and needs and convert the data to whatever format that app requires. Battery: uses 3 AAA batteries. While some people complain that it doesn't use a rechargeable Li-Ion battery, I prefer it this way. I bought NiMH rechargeable AAAs (so I have two sets) but I always know I have the option to pop into a convenience store and grab AAA alkalines off the rack in a pinch. With a non-removable rechargeable battery, if you forget to charge your battery, you don't have any recourse. No logging that day! I know when I vacation with my family and we have been out all day walking the city, by the time I get back to the hotel, I'm tired, kids are tired, all the crud you bought that day has to somehow fit in the suitcases, etc. It is very easy to forget to plug the GPS data logger into the charger before bed and not realize it until the next morning when you are all up and getting ready to head out for the day. But I can always grab some alkalines. Other GPS loggers with built in batteries don't give you that safety net. On the flip side, the 3-AAA batteries do make the device a bit larger than many other loggers. Mine is slightly larger than my Nokia 6263 flip style cell phone, to give you an idea. But it is still plenty compact to throw into my backpack and not be an issue. Logging interval: With the recent firmware update, you can now pick between several time intervals, 1 second, 5 seconds and 10 seconds plus different levels of logging from recording all kinds of data (travel speed, direction, number of satellites being used, etc.) to bare bones (basically Long & Lat). So the loggers internal 128MB can hold anywhere from 72 hours of tons of data to 2880 hours of minimal data. to see the various logging options plus the other features of the logger. Even at the one second interval with full data giving 72 hours of logging, I think this is plenty. That is three days if you left it on 24 hours a day. With turning it off when sleeping and maybe other "down" times (while eating, etc.) you can easily get a week of logging out of it. But with the other logging interval options you can go MONTHS before you had to empty the device. 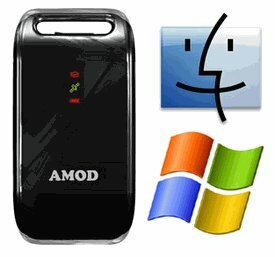 One nice thing about this logger is because it shows up as a mass storage device on a computer system, I can use my On The Go (OTG) portable hard drive to download the data off the logger into the drive without a computer around. So a two week vacation without a computer and my OTG portable HD is enough to let me do full 1-second data logging. Finally, accuracy: Here is the thing, they all kind of have problems in a way that most of us didn't realize all GPS systems suffer from because many of us are used to Car GPS units (e.g. Garmin, Tom Tom, etc.). GPS accuracy kind of jumps around a lot and when you stand still, a GPS receiver will have you jumping around your location by many meters in some cases. In Car GPS units, when you are not moving, it doesn't update the map on the screen so you stay still on the map. When you do move, the GPS not only gets satellite data, but also calculates your speed and direction to determine where you next point SHOULD be so any weird readings do not result in the display jumping all over the place. In addition, the built in Maps help by determining where the roads are and where you car SHOULD be located and heading so you stay on the road and the display doesn't suddenly jump to show you in the adjacent field. With these data loggers, you don't have mapping software to help. In addition, the chip sets often have a feature called "Static Navigation" (SN) that helps to "smooth" a track being logged by not logging data unless you are moving at a certain speed (I think 3 MPH or faster). The problem with SN is that when walking, you are often NOT walking fast and so you tend to get a data point, then the next one may not be until you are a couple blocks away because you are walking slow. So you may get straight line approximations between two points which may show you traveling THROUGH a building rather than turning the corner around it. This logger, the AGL3080 comes with SN ON. But on the web site you can download firmware to load into it to have SN OFF. This gives you a much more accurate track, but does come with trade offs. Basically when you stand still, it keeps logging your position and because GPS will record points all over the place near you, you end up recording a bit of a "cloud" of points around your location when standing still. The longer you stand still, the larger and more dense that cloud of points gets. In addition when walking down the street, you may get some stray points recorded off your path. In either case, for most of us this isn't really an issue since we tend to be more interested in figuring out approximately our route and which block the photo was taken. We don't really need to know exactly which store front we were in front of or which boulder we were standing on in a location thousand of miles from our homes. I would be just happy to see my map of points in a city nicely spread around the map approximately on the block where I was. But most points will be spot on. You just have to realize there might be some variability. If you are a hiker and need much better accuracy, you may be better off looking into one of the $200+ mapping devices rather than a $65 logger. As pointed out by another reviewer, the firmware can only be updated on a Windows machine, but most of us have access to one even if we tend to use Macs and you likely will pick one firmware or the other and stick to it, so it isn't like you will need to do this very often at all. Because the firmware for both versions total to only about 5MB and because this logger shows up on the computer as a thumb drive, you can load the folders of files for both updates onto the logger to always be handy. So if you are on the road, if you can get 3 minutes of time on a windows computer, you can change FW versions as needed. But most of us won't likely need to bother with it. Conclusion: I like this logger. It does what it says it does, allows me to use rechargeable AAA batteries but also grab alkalines in a pinch, logs in an industry standard log file that is plain text, and loads on my Mac desktop like a thumb drive. Its accuracy is fine for my needs and is not a band breaker. Ignore references to the bundled software in other reviews. I never even bothered to load anything of the CD when I got mine. I use other third party applications to Geotag my photos. I bought this via Amazon/Semsons several months prior to a cruise. I use it as both a data logger and to geotag my photos in iphoto 09. As a data logger, it is somewhat underwhelming. It is nice that I can set it for 1, 5, or 10 second, and to record minimal or more complete NMEA data. However, the GPS itself is fairly inaccurate. I use it to GPS log my cycling rides, and it is usually accurate, putting me on the bikepath or side of the road that I am on. However, it is occasionally (10% of the time) way off, by a block or more. The accuracy improves if you stay put, and generally speaking, I find that my photos are fine from a geotagging standpoint. For my data logging, I just convert the NMEA data file with GPSBabel+ to a KML file for viewing in Google Earth. I am still looking for a useful cycling GPS application that gives me a pleasant way to view my mileage, topography info, average speed, etc. Overall, definitely worth the money. I would pay a bit more for better accuracy. I did a lot searching before my purchase. The reviews here where a big help in deciding which unit to buy. When I took it out for a test run I forgot to adjust my camera clock for Daylight savings time, so when I tagged the photos they were off by a mile. When I figured out my mistake I tried again. Right on target this time. I have had a lot of fun tagging the photos and putting them up in the web for my family and friends to see on a map where in Texas I was shooting from. I took a trip out west just to check it out. Great product. Have had it nearly six months without a hitch. Syncing time with tracker, computer, and camera your pictures will be geotagged. (Use a program like geosetter to do it. )Using lightroom as an example, includes geotagged data in exif portion and a link to google maps after refreshing original pictures with geotag data. Maps altitude as well, using babel to transform the files into nearly any format you need to see your trip track on a google map. Push a button on side to create a waypoint. Use it effortlessly on windows and mac as my partner has a mac and me a pc. Learning curve for geotagging is moderate to easy, with much information on the net for what you need to do. Neat to see where you've been and exactly where that picture was taken. Just make sure your camera time is set exactly to the correct time. Great gadget at a bargain price! I've had a couple of outings with the Amod AGL3080 so far and I have to say I'm pretty impressed. My first try I made the mistake of firing it up indoors which caused it some confusion when I took it outside. I'm told they all do that. But on subsequent trials I fired it up outside and in just a few seconds it had acquired it's satelites. In examining a couple of hours of recorded logs on google maps, I only found one spot (a single position post) that strayed off my actual path by more than about six feet. The only thing about it's functionality I have an issue with is marking a way point with it. I'm having a little trouble knowing if I've successfully marked a way point or not. I don't expect to need that very often for my use but it would be good to know that I've succeeded when I try to use that feature. Other than that, it would be nice if it had a simple lcd display with basic function info and maybe a way to view my current long/lat BUT since I knew it didn't have that I can't fault them for it. The software that comes with it is VERY easy to use to mary up the log to my photos and using the default logging mode gives a very accurate geotag for the photo. This cell-phone sized GPS logger does exactly what it claims to do. It comes with a convenient velcro strap and hook so it can be attached to your camera bag; I prefer to use a carabiner since the plastic hook seems cheap. The AGL3080's interface is mind blowingly simple: blinking green lights are good. Solid lights are bad. You just power the thing on and wait for the satellite reception indicator to blink green and you know it's good to go. With that said, this device could be quicker at picking up a signal. It's taken me upwards to five minutes for it to resolve when there's cloud cover or I'm indoors. This isn't killer, but I do wish it was quicker. I bought this GPS a little over a year ago, mainly for tracking the locations of photos that I take while hiking or traveling. The reason I bought it was that it was clear that it would work with any operating system because it just acts like a USB drive that you can get the logs off of. However, about a month ago I read some of the newer reviews on this page, and discovered that this is actually a feature called "Static Navigation" that makes all the GPS tracks have these huge gaps in it, and it can be disabled by installing new firmware. The process of installing new firmware wasn't particularly smooth: it required finding a Windows machine, downloading the firmware from the company's somewhat-sketchy-looking Website and running a pretty sketchy-looking piece of software (was it installing some spyware too?) that crashed the first 10 or so times I ran it and then finally worked as I tried starting it slightly different ways. But in the past month, now that I have the firmware with "Static Navigation Off", the GPS records of my hikes have now become much more accurate, and I don't have to extrapolate between points to figure out where I took particular photos. It would have been nice if the device they shipped me a year ago worked that well, or at least if it had some information explaining how I could make it work better for my uses. With Apple releasing iPhoto '09 with support for geotagged photography I immediately wanted to utilize this new feature set. I do a lot outdoors: Geocaching, Boy Scouts, hiking, bicycling, so I saw a great way to track my "expeditions" through my photography. I found this GPS Data Logger and it advertises heavily that it is MAC OSX compliant. I looked at the reviews for this device on Amazon and various other websites. Most of the negative comments didn't alarm me as they were for the most part due to a misunderstanding of what the device does or they didn't like a feature set. 1. GPS Photo Tracker software - This software comes in the box from AMOD and embeds the GPS locations into the digital photograph JPEGs. This is written only for Microsoft Windows and does exist for Macintosh OSX. In fact if you have Vista 64 don't bother installing the software that comes with the device; it will crash. This is a known bug and AMOD has a fixed version on their website. 2. The GPS device looks like a thumb drive to any computer and the GPS tracks are stored in ASCII. This allows any computer to look at the data, there are no proprietary formats or synchronization drivers. This is what they call "Driverless" and is a in my opinion a very good decision. 3. Upgrades to the firmware must be run from Windows computers. If you don't happen to own a Windows computer, you're out of luck. This is not a very good decision when calling your product MAC compatible. You might be asking; "So, if the photo-linking software supplied by AMOD does not exist for MAC computers and firmware upgrades only exist for Windows computers, how can they say it is compatible with MAC"? The device itself is compatible with MACs because it looks like a thumb drive and has a third party software package that comes in the package to link the GPS tacks to photos. More on the third party software later. I think that the firmware upgrades should be written for all operating systems that it is deemed compatible. For example to be called Macintosh compatible, firmware upgrades should run from a Macintosh computer. Garmin now supports MACs and did not claim to be MAC compatible until they had the support software for Macintosh computers. To allow Macintosh users to link GPS locations to JPEGs, the AMOD is shipped with a JetPhoto Studio. Out of the box you can use this software to attribute the photographs with the GPS track locations. However I say attribute because the GPS location is not embedded into the JPEG. The location is kept in the JetPhoto photo album and assigned to the photo. What this means is that if you link the GPS location to the photograph in JetPhoto Studio and then send the photo to a friend the GPS location does not go with the photograph, it remains only in the JetPhoto album. To actually embed the GPS location into the JPEG you must purchase JetPhoto Studio Pro for an additional $25. I was not happy about this, but I saw other features I liked in the Pro version that I like and purchased JetPhoto Studio Pro. I tested embedding the GPS location into my JPEGs and it works fine. But now I must run my photos through JetPhoto and then import them into iPhoto which takes extra time. The only other thing that I think important is that when I first tried the device it worked, then I did a "Clean Disk" operation and that was the last time it worked. I tried installing the latest firmware, removed the batteries, etc. nothing worked. I made a quick call to Semsons (who sold me the product through Amazon) and they determined it was faulty. They replaced it and the new one has been working fine for the few days I've had it. The important part, GPS logging, is excellent. Seems to track fairly accurately; I don't have anything to compare it against, but from reviews on similar products, seems to have similar accuracy. It also has good reception. I was able to acquire and maintain a fix from inside my house and in the office. Very simple to use. Collected data, plugged it into my Linux box, copied the log files off the presented flash drive. I then converted the logs from NMEA to GPX using gpsbabel, and correlated the locations to my photos in digikam. The biggest pain was the firmware update. I downloaded the most recent (V2.2) firmware, and tried to update. First off, you have a choice of two downloads, one with static navigation enabled, the other without. No explanation as to which I might want. Some WEB searching, I found that for use when walking about, you probably want the one with it SN off. Next, after unzipping the download, checked the README. It listed five files which should be included, and that the upgrade is performed by running 'fwupgrade.exe'. Well, there was no 'fwupgrade.exe', but there was a 'GoNoGo.exe'. Tried running GoNoGo on three differant WinXP boxes, and in each case it crashed. Next I tried the fwupgrade.exe from the V2.0 download, and it behaved the same. Finally, I upgraded to V2.0, powered on then off the unit, and then successfully upgraded to V2.2. The newer firmware offers six logging modes. The documentation tells you approximately how many data points of each type, and the number of hours of samples will fit in the unit for each format, but again, no explanation as to which format you would want to use under what situations. I just chose the one with the most data types at five second intervals. That seems to work.